That's good news. It's an odd house, but pleasing. RMS had a lot to do with its design, and most historians credit him solely as the architect. I don't buy "solely," but "substantially." The one detail that has always bothered me is the design of the 5 principal windows in the double-height living room. They allow as much light as needed, but they fail as view windows. It's disturbing to try to look through them, unless you stand right next to them. There is also no upper level space (other than the end of a hallway) to function as a balcony with views toward the windows. On the other hand, the arrangement of dining balcony and kitchen is quite nice. Very cozy. The place is a hive of activity, and the amount of lumber currently supporting the structure - inside and out - is staggering. We've been asked not to share photos of the interior, but I'll see about getting some proper shots of the work going on to the exterior. My favorite photo of the house continues to be this one, found in David Gebhard, "Schindler," p 41. 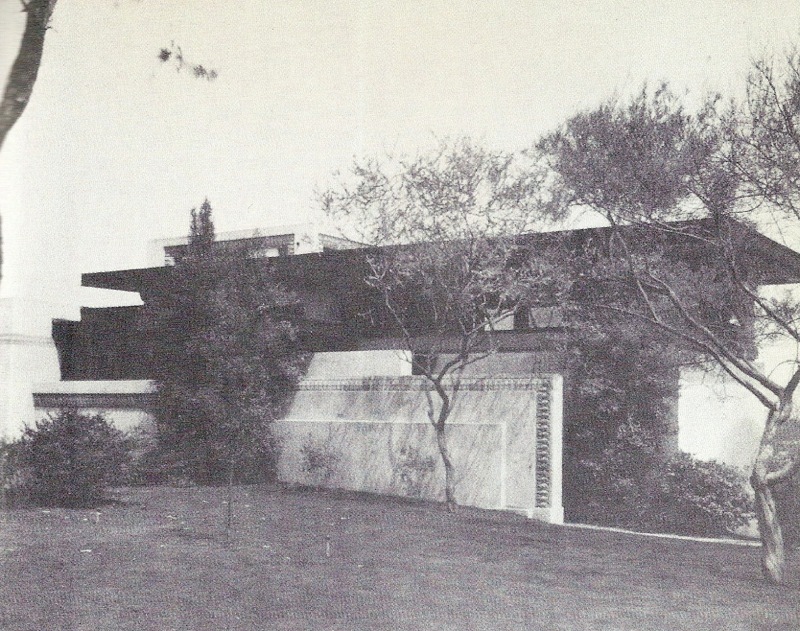 Unfortunately, it is identified as "Director's house, Olive Hill, Los Angeles, 1920." to be most felicitous . . . 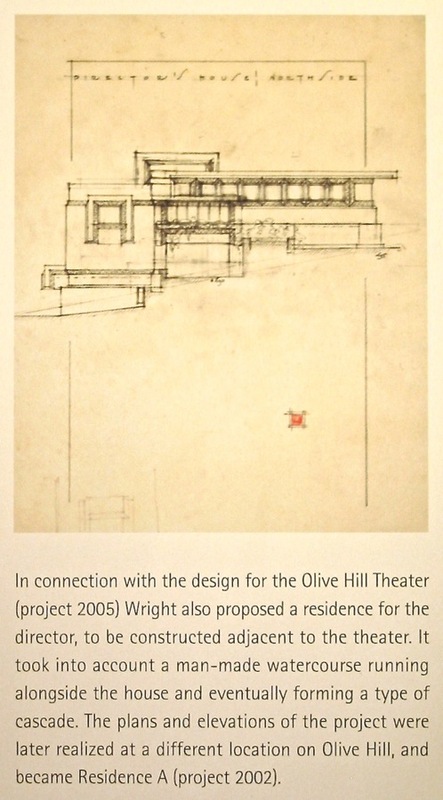 In the initial Olive Hill plan, the "Director's House" was originally intended to sit southeast of Hollyhock House (about where the elevator is today, for those familiar with Barnsdall Park). The stream emanating from the Spring House would have skirted its perimeter on the way down the hill to the pond on the Vermont Avenue side of the hill. When Wright revised the plan, resulting in the eventual "Residence A" and "Residence B", the original Director's House design was re-purposed for A - quite literally, as the DH floor plan drawings were simply modified as needed and relabeled. As I recall, the house was rotated 90 degrees CCW for the new siting. The contrast of color in the photo is due to the stucco walls with concrete trim. They were, in fact, different colors. 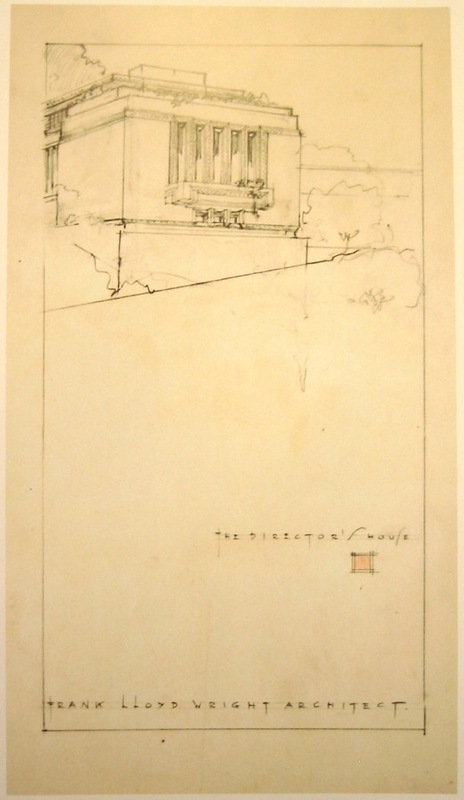 Both Schindler drawings are of Residence A, which includes a garage (not shown) at the left end of the drawing, located below the living room. Unfortunately, there is no surviving detailed plan of the Director's House ... at least not one that has been published ... so the alterations made to fit the different contours of the land are not clear. As built, the topmost element over the living room block shown as extending the full length in the first drawing, was reduced to a small access space leading to a larger roof terrace, as the second drawing indicates. 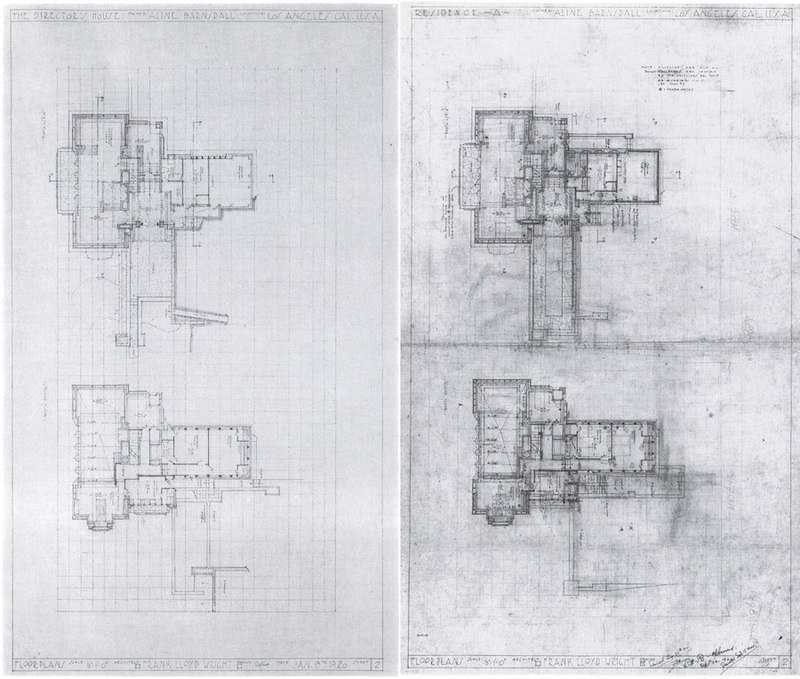 When Wright revised the plan, resulting in the eventual "Residence A" and "Residence B", the original Director's House design was re-purposed for A - quite literally, as the DH floor plan drawings were simply modified as needed and relabeled.